Well December has been a busy month, and I wish I had had the time (or made the effort) to devote individual blog posts to all the fun times we've had, but I didn't. My last goal of 2008 was to get a post in. So here is a (very long) recap. 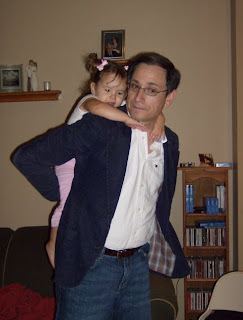 Friday, December 19th was Amelia's 2nd birthday, although if you ask her how old she is she says, "Three." We had a small celebration with Erik, Charlotte (who slept through it), and me. It was really nice not to have to do a big production. I made beans and rice for dinner, which pretty much is Amelia's favorite dinner (with spaghetti and tacos being close seconds). I also made a cake for Amelia and was once again reminded that I did not inherit the cake baking genes from my mother. (You can see her fabulous creations at www.CakeDreamsbySally.com) I made vanilla cake, and even though I followed my mom's directions to watch for the sides of the cake to start pulling away from the edge of the pan, all three layers were under baked and turned out more like pound cake after they fell. Luckily they still tasted good. I didn't feel like making icing, so a little butter cream icing from Betty Crocker worked for me. After we enjoyed cake it was time to open presents. Amelia was all for this. She tore the wrapping paper off the first present and then proceeded to go for another present. We had to point out that there was something inside the box. Even better!Lucky Amelia received a doll stroller from Mommy and Daddy, an Elmo guitar from Aunt Catherine, and super cute outfit from Nana. Later she received some giant lego-like blocks from Nana and a tea set from Grammy and Grandpa (I'm sure its for herbal tea). 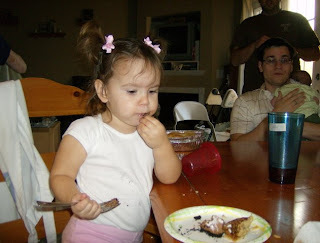 The next day Amelia had a piece of cake with lunch, and after she was done she asked, "Presents?" This box was in the running for best gift. Amelia didn't have to wait long to open presents as we celebrated Christmas three times! Sunday after church we headed down to Harkers Island to celebrate Christmas with Erik's Dad, Grandparents, his sister Allison, her husband Russell, and Russell's daughter Avery. Christmas Eve was a miserable day full of wrapping all the presents, a doctors appointment (Amelia has an ear infection), folding laundry, trying to keep kids happy, and packing for our trip down to Nana's house. I originally was hoping to leave around 2pm. The time kept getting pushed back as 3pm, 4pm, and 5pm came and went. Finally around 6pm we were ready to get on the road. Thankfully it was only an hour long drive. We got settled in at Nana's and woke up the next morning to see that Santa had come! Amelia and Nana with a puzzle. "What did Santa bring me Mommy?" I carried on a tradition by taking a picture of Charlotte in her stocking. 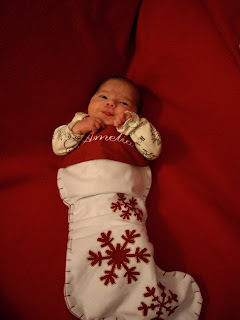 This is Amelia's stocking picture. Last, but not least, we headed up to my parents house last Saturday. This is the Amelia opening the tea set that is actually her birthday present. In a way I'm glad the craziness of Christmas is almost over. The bad part is that we have to find a place for all the stuff when we get back home. And we have to take down the decorations. It has been wonderful to spend so much time with our family members this holiday season. 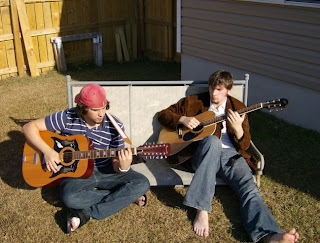 We are looking forward to 2009 and the adventures it will bring. This past weekend we spent time with Erik's family mourning the loss of his step-father Johnny. Johnny died last Wednesday, and although he was having health problems, his passing was quite shocking. It was evident when hundreds of people showed up for the visitation that he will be missed by those he left behind. The man I will remember is one who loved to tell a joke and loved his friends and family. The family is doing well, thanks to a lot of love and support from extended family, friends, and neighbors. Thanksgiving is probably my favorite holiday. There is no stress of buying gifts, no leftover candy, and no worrying about how late my stupid neighbors are going to set off fireworks. Its all about the food, and of course being thankful. And I am thankful for the food. 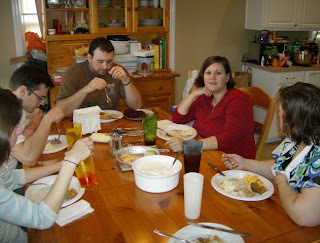 This year, in what was supposed to be an effort to make things less stressful for us (in not having to travel), Thanksgiving Dinner was held at my house. I'm not sure it was less stressful, but perhaps stressful in a different way. Wednesday was spent baking. I made pumpkin pie and pecan pie, pumpkin chocolate chip muffins, and cream cheese danishes. The latter two were for breakfast. Wednesday night most of the family arrived (Catherine and Mark had spent the week with me) and the chaos ensued. Well, organized chaos. 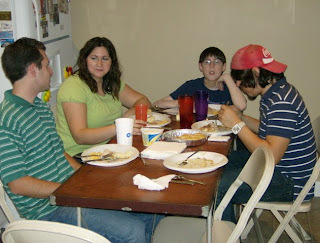 Christian and Mary spent the night at a hotel, but the rest of the Plautz family stayed at Casa de Lewis. Catherine and Bryan slept in Amelia's room, Mom and Dad were in the guest room, and Mark, Michael, Daniel, and Alex kicked it in the living room. It was tight quarters and a lot of stuff. Still, it makes me happy to have my family together even when it is crazy. Dinner was delicious and our 20lb turkey surprised everyone by being fully cooked in an hour and forty-five minutes. It was still juicy too! 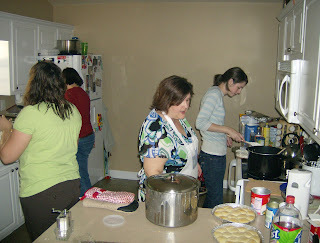 The fixin's included macaroni and cheese, mashed potatoes, gravy, stuffing, green beans, green bean casserole, sweet potato casserole and rolls. Dessert was pumpkin, pecan, french silk, and lemon meringue pies and a blackberry jello dish. Mmm, so yummy. In fact I think I may have to go enjoy a piece of pie when I'm done. Charlotte slept through dinner so I actually got to use two hands to eat. That is something to be thankful for! I am so thankful and feel so blessed. I have such a wonderful family. How the guys chilled while waiting for dinner. 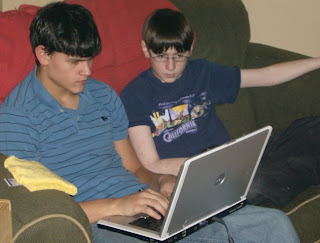 Playing old school video games on the computer. Last Sunday we had the whole crew come and we blessed our sweet new daughter. My brother Eric is leaving on a mission (Georgia Macon) on the 19th and we wanted to have him be able to participate. I caught some flack for being at church the Sunday after giving birth, but next week is our Stake Conference, and Eric is speaking in church, so it had to be last weekend. Here are a few pictures from the day. Erik gave a beautiful blessing and it is always nice to have our family all together. 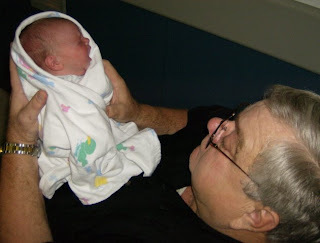 This birth experience was much different than the first time around. For starters I actually had contractions on my own this time! With Amelia my water broke and then nothing happened, so I ended up having to have pitocin induced contractions, which are horrible! I started having contractions Friday night around 11pm, but they weren't really painful or regular, and they stalled out around 4am. Saturday around 11am, I started having some contractions again, and had them on and off all day, but again, they weren't all that painful or regular. Around 11pm they stopped, and I was able to get a couple hours of sleep before they started up again around 1am. This time they seemed more regular and they started getting painful. Erik woke up around 2am, and kept me company. About 3am, I figured out I probably wasn't going to get any more sleep and I decided that if this was happening, I was going to do what I could to get things going. I broke out my electric pump, and did 20 minutes of pumping and 20 minutes of walking. I had read this was a good contraction picker upper. After two rounds of this my contractions were much more intense and starting to get pretty regular. 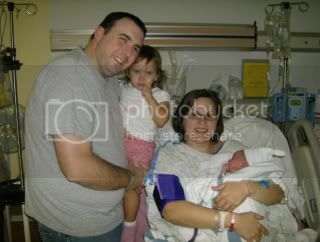 When the contractions were 8 minutes apart and lasting 45 to 60 seconds (around 4:45am) , we started making phone calls. First we called Erik's mom, who would be staying with Amelia, and then my mom and sister. 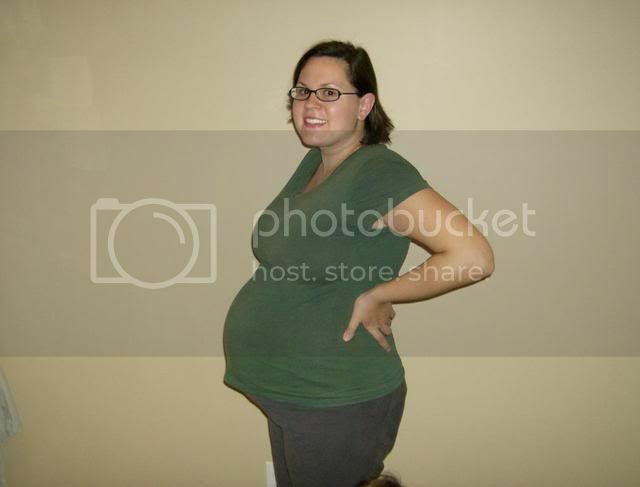 We were at the hospital by 6:30am, and much to my amazement and delight, I was 4cm and 80% effaced. Go me! I gratefully received my epidural. The doctor broke my water around 11:30am and pronounced me 7 to 8cm and I we were all thinking we'd have a baby in the next few hours. Well, of course it didn't work that way. My contractions started slowing and pretty much stalled out between 1 and 2pm. By four o'clock I asked for some pitocin to get things going. It started working, but slowly. About 4:45pm I was pronounced fully dilated and effaced and we started making predictions on when the baby would be born. Catherine, optimistically guessed 5:05, my mom said 5:15, I said 5:35, and Erik said 6:15. I looked at him and said, "6:15? !, You better not be right." Well, like I said, things were progressing slowly. I didn't even start pushing until 5:45, and lo and behold, Charlotte popped out exactly at 6:15pm. 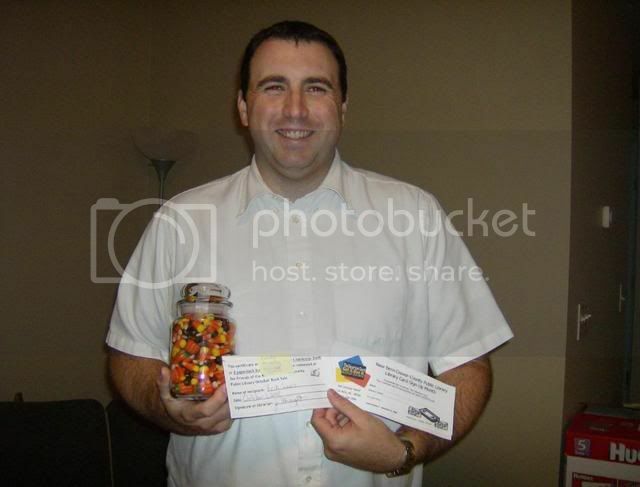 I guess Erik's guessing skills are being honed - I mean he did win the candy contest at the Library. 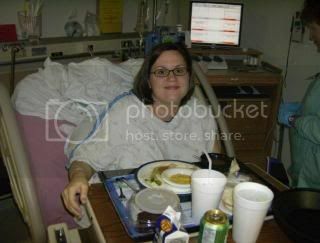 By the time I had delivered I was starving, and as much as I was happy to have my baby, I was truly delighted when the nurse brought me my dinner tray. Erik's mom brought Amelia, and she was none to impressed with what turned out to be baby sister. All in all, things have been going well and I'm not even too sleep deprived yet. We'll try to keep everyone updated and thanks for all the congratulations! We welcomed Baby Lewis to our family Sunday night at 6:15. 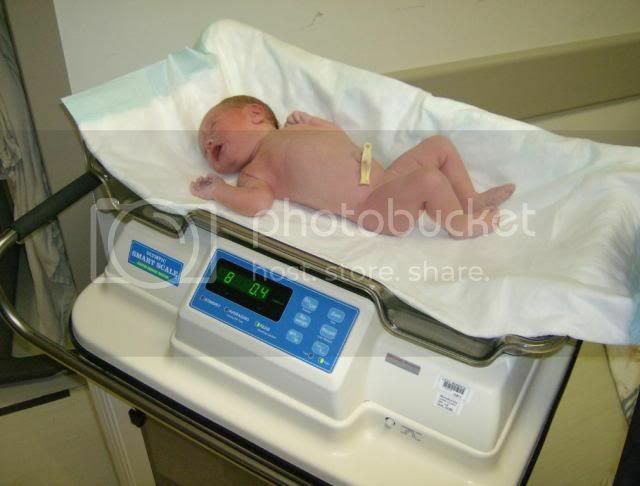 She was 8 lbs, 20 in. long, and very healthy. We'll have pictures and a name posted soon. 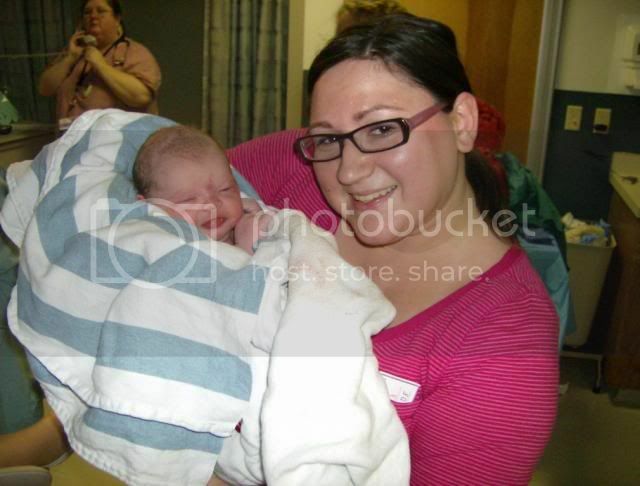 Mom and baby are doing fine, and recovering in the hospital. 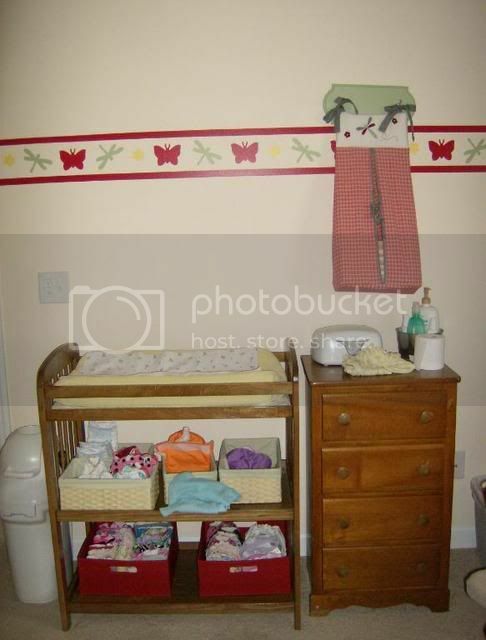 I thought I would share some pictures of the nursery (a word that amuses me to no end) or as it is also known, Amelia's, and soon to be baby's, room. With Amelia, our time, attention, and dollars were focused on getting the room ready, and everything into the room, before she was born. 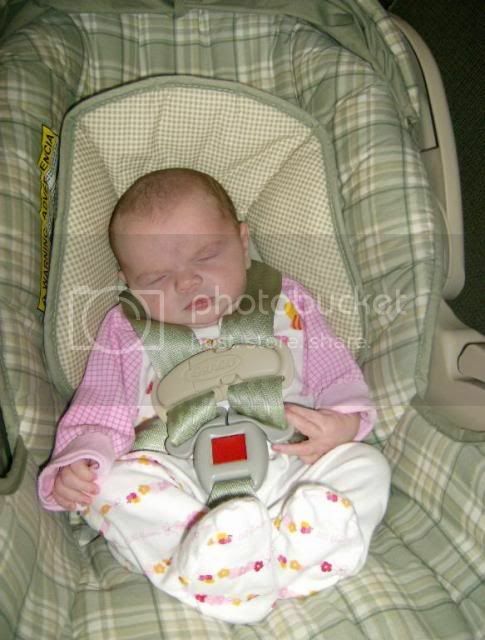 After she was born, the room was more or less a complete disaster. There were bins of too small clothes and clothes to grow into everywhere. After a while I just started throwing everything that didn't fit into clothes baskets in her room. Needless to say, it really wasn't something to show off. 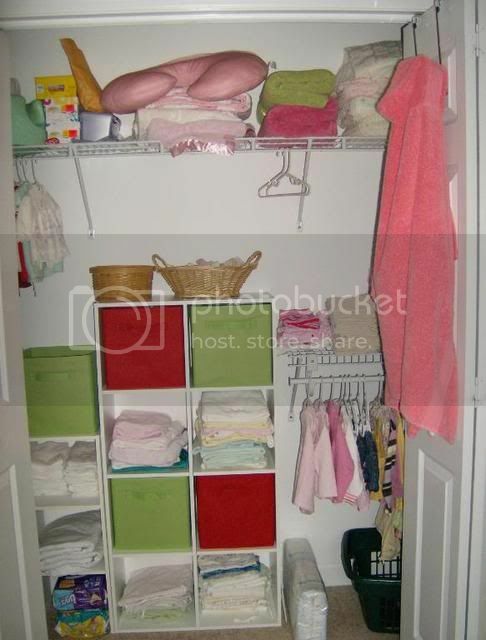 This time around, we've put our time, attention, and dollars into organizing so that we can fit two children's worth of items where there was previously only one. Amelia is still using the crib, but I think she'll be in a twin bed before the year is out. 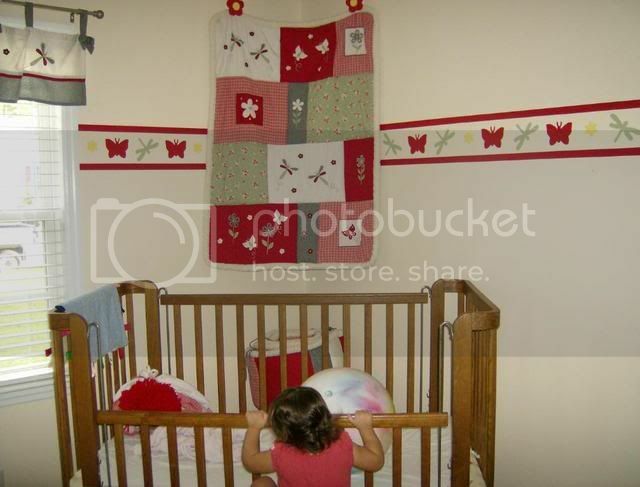 Baby girl #2 will be in a pack'n'play in our room for at least a couple months. The dresser - refinished by Erik. We got the dresser from a thrift store when we were first married. Before Erik refinished it, the dresser was white with light green drawers. My beautifully organized closet. I heart closetmaid. 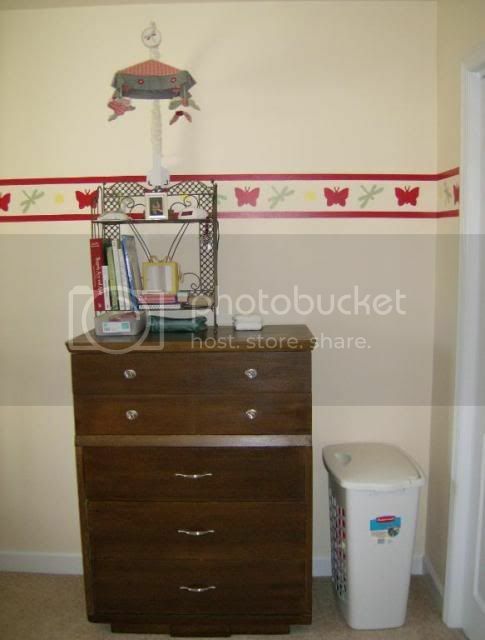 And yes that is a hand painted (by me) border around the room. I really love the way it turned out. As a side note, I know I've been tagged twice, and I promise to respond shortly. Well I'm on countdown to this baby arriving. It could happen anytime between now and two to three weeks. Although, if we were placing bets, I'd definitely go with two to three weeks. Here is me as of yesterday morning (first thing, before a shower, and still in my PJs). Because we are having girl #2, and her due date is approximately six weeks earlier than Amelia's due date, there wasn't much we had to do in the way of preparation. Most of it was organization, and we've been nesting like crazy over the past few weeks. Erik is a big time nester - in fact I don't think I ever nested while pregnant with Amelia, but Erik sure did. This time around I've been much more gung-ho about getting things in order. 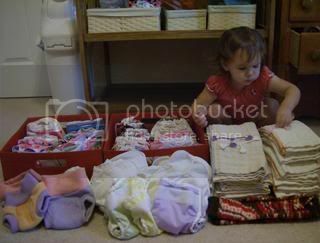 One of the things I did get to do was prepare my diaper stash. For those of you who don't know, we use cloth diapers and for anyone who is truly in CDs their diapers aren't just diapers, they are a diaper stash. 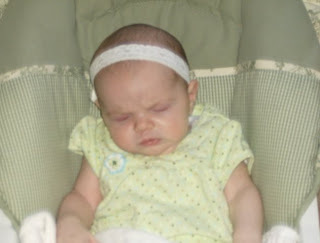 We started CDing when Amelia was about six months old, so CDing a newborn will be a whole new experience for me. I've enjoyed buying itty bitty diapers and getting ready to put them on an itty bitty newborn. Well as itty bitty as an 8ish pound baby is. 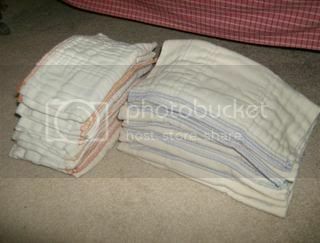 Not that anyone who reads this blog truly cares, but I though I'd share pictures of my diaper stash. 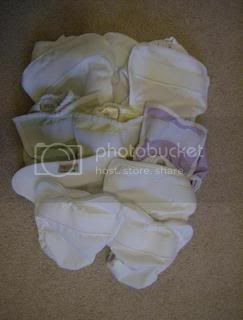 Here are the prefolds, what most people think of when they hear cloth diapers. These are from Green Mountain Diapers and they are scrumptiously soft. These are fitted diapers, they still require covers, but they are a little easier to take on and off, and they come in super cute designs. 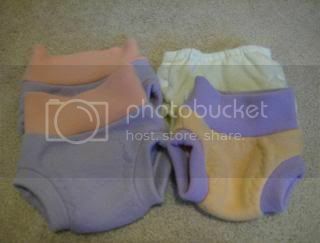 These are the AIOs (all in ones), they are the most like "regular" diapers. They don't need covers, and while the outsides aren't all that cute, often the insides have cute designs. The covers come in two types, PUL and wool. PUL (Polyurethane Laminate) covers are waterproof and what the old school type might call plastic pants, but PUL is a lot nicer. Wool covers are super breathable, and when lanolized can go through many changes, air out, and be used again. And here is the whole thing with Amelia playing in the background. I know some people think it is a lot of work, but it really makes me so happy. Once baby girl gets here I'll post some pictures so you can see how even more adorable they are on a little baby. My feelings on the following subject can best be related through the chorus of the song "Without You" written by Pete Ham and Tom Evans, originally recorded by Badfinger in 1970, made popular in 1972 by Harry Nilsson, and covered again by such artists as Heart, Air Supply, Mariah Carey, and Whitney Houston. I've recently experienced a loss and it has been difficult for me to go on. 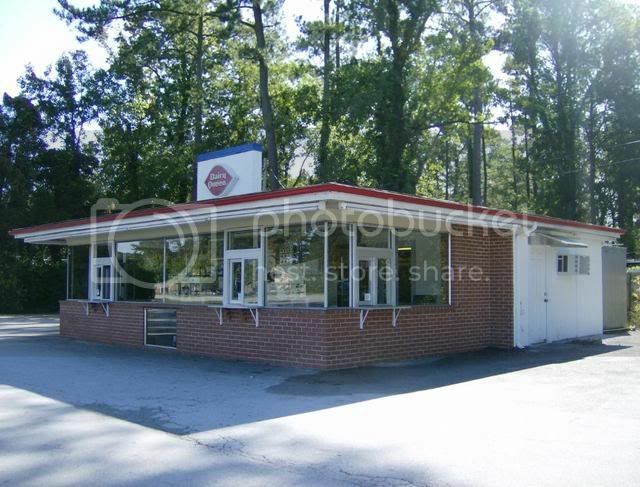 Every fall the Dairy Queen in New Bern shuts down until the spring. This is a very sad time of year for me. Reeses cups with chocolate ice cream Blizzards bring such joy to my life, and to be denied this pleasure for months at a time . . . well I'm sure you can relate somehow. While it is true that during these dry months I can still enjoy at blizzard at a number of other Dairy Queens, such Havelock, Morehead City, and various Raleigh locations, being able to drop by the local DQ when cravings hit is out of the question. Erik, Amelia and I enjoyed our last blizzards of the season on Friday night. Until the spring I have resigned myself to be tortured with longing each time I drive by the vacant store. Then one day next year, it will suddenly be open again. I may be on my way home one day and see cars in the parking lot and it will be like manna from heaven. Until such time I will have to try to fill my cravings with Baskin Robbins, Cold Stone Creamery, and Hagan Daz. Or, since I'm about to have a baby and will need to get off some pregnancy weight, I might just have to eat an apple. Over the past week there have been some small, if not noteworthy, highs for the Lewis family. Last Tuesday Erik and I went over to the library. I needed some more fiction and Erik needed a couple books about leadership for this Executive Leadership Program he is a part of. 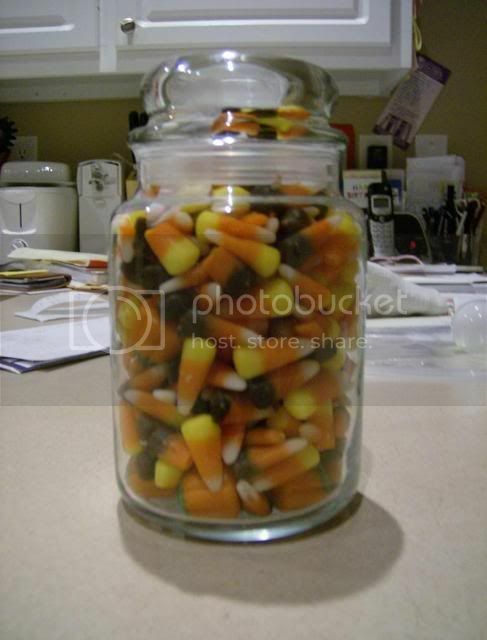 As we were checking out, Erik noticed a jar of candy corn and pumpkins behind the librarian. When he inquired about it he was told there was a "Guess How Many" contest going on and that it was the last day of the contest. He decided to enter and I declined because I do not care for candy corn in the least bit. He studied the jar intently and then wrote down his guess. On the way out he told me he had guessed there were 365 pieces. I gave him an "okay, great" smile and a nod and promptly forgot about it. Well obviously he won or else I wouldn't be telling this story. Wednesday afternoon the phone rings and the caller asks for Erik, to which I replied he was at work. The caller identified herself as a librarian from the Craven County Public Library, and told me that Erik had been the closest guesser, and he could come down and get the candy and prizes. Erik had guessed 365 pieces and there were 366 pieces. That evening Erik went down and picked up the candy, two certificates for a library movie rentals (a $2 value) and a certificate for 2 paperback or 1 hardback book at the Friends of the Library Book sale (the value to be determined later). The second score came earlier that same Wednesday. I had taken a trip to Target and was moseying down the isles when I saw that the shower curtain I'd been eying for months, which was previously $26.99 was on clearance for $6.74! 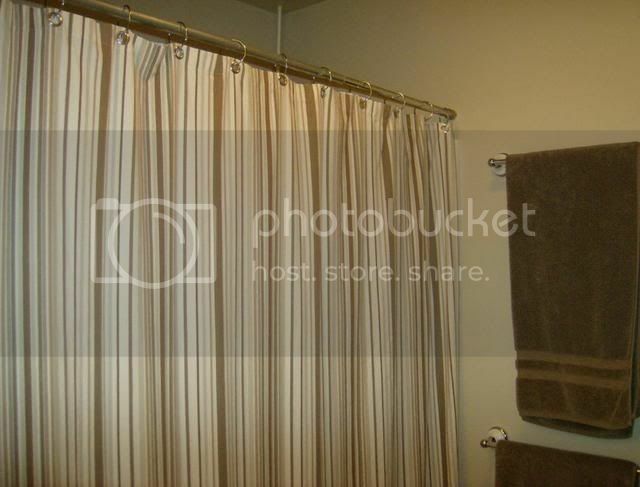 It totally works so well in our oh so neutral bathroom. And last but not least, I had about ten minutes to kill before my OB appointment yesterday so I decided to stop in our local Goodwill. 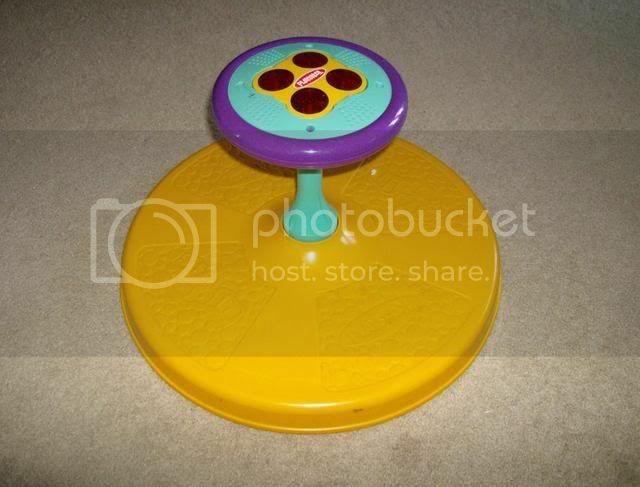 I saw a Sit'n'Spin for sale for $2.99. I knew I had minimal cash on me, and I never carry the checkbook, but I broke out the calculator on my cell phone and figured out the total would be $3.19 (price x 1.0675). I decided to raid the coins in the ash tray of the car and add it to the $1 bill and coins in my wallet. No joke, between what was in my wallet and the coins in the car, I had $3.19 down to the penny. 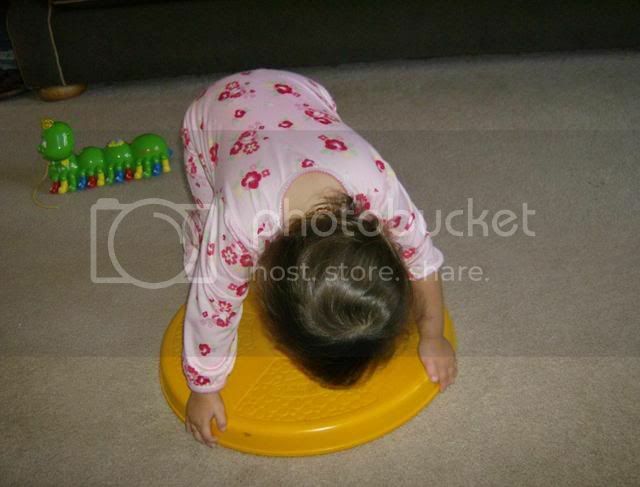 When Erik got home he decided to see if the sound worked if he put some batteries in it. Much to Amelia's delight, and my undelight, it did work. 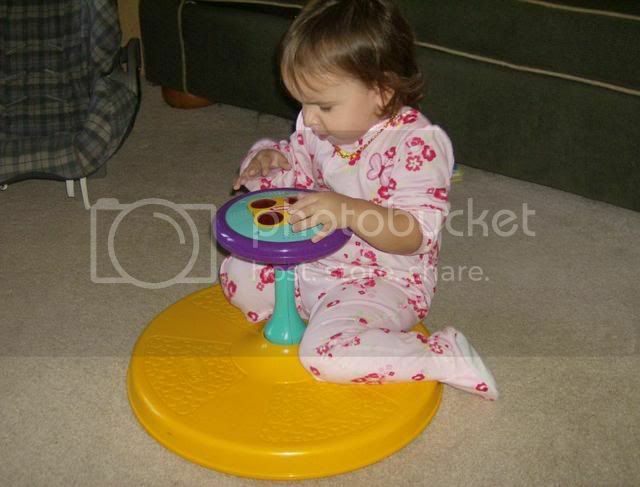 Why do they have to ruin a perfectly good toy by putting lights and music on it? 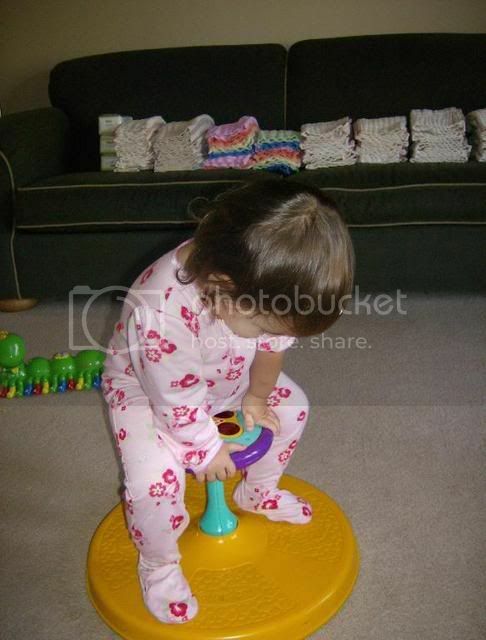 Amelia showing various ways it can (safely and not so safely) be played with. So that's it. Sometimes it is the little things that bring a smile to my face.